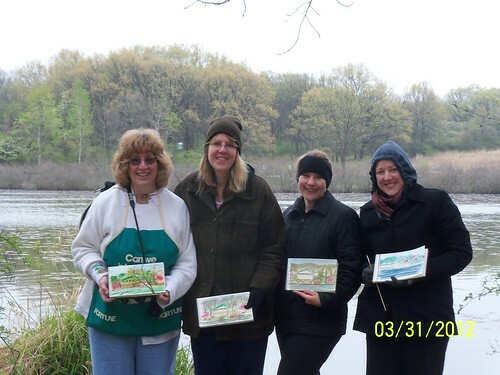 Sketch Class Results March 2012 – Let's Paint Nature! 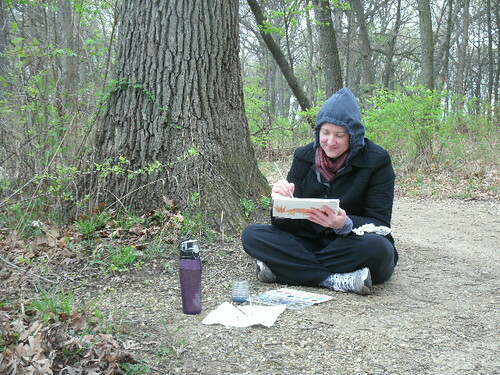 A little cold and a little gray….but that didn’t stop our fun at the Little Red Schoolhouse Nature Center Sketch Class! 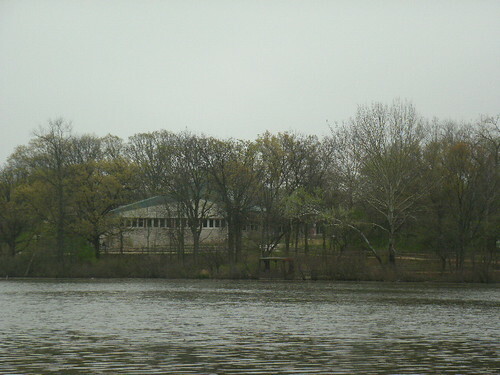 I saw a notification on the Illinois Bird List website that a pair of Osprey were building a nest on the platform in Long John Slough, so I was very excited to tell the group and see it for ourselves. We did spot the Osprey and nest with binoculars. We also observed one flying above the Slough. Oh YES! Birding excitement in the morning! 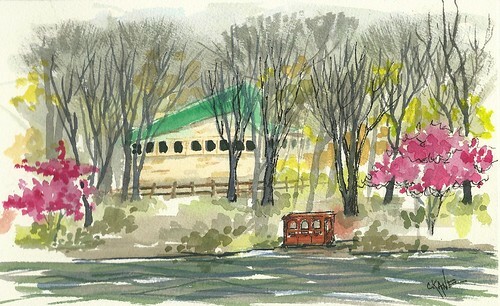 We decided to face south and sketch the new nature center building from across the slough. Each one of us found a comfortable spot and got to work. Alanna has found a bench that serves as a table too! Good idea! Michelle’s mini tripod chair is light weight and can be carried anywhere. Got to get me one of these! Katie and I choose the cold wet ground where we can spread our art table all over the place. Dirt is fun. Way fun. 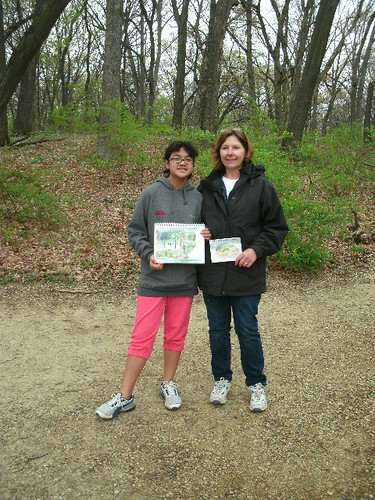 Ce Ce and Sue made wonderful sketches but had to leave early. It was so nice to have them along! The rest of us painted as much as we could. There was a lot of moisture in the air and our watercolors were not drying. We decided to finish at home. Here is our work in progress. This is my finished sketch. Spring is about one month early in my area. I love the redbuds, however I am concerned how early everything is developing. 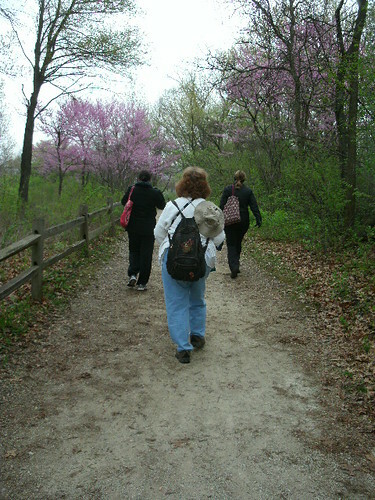 No class is complete without a short hike (optional). The redbuds are beautiful but are the insects ready? This is my way too early spring concern. 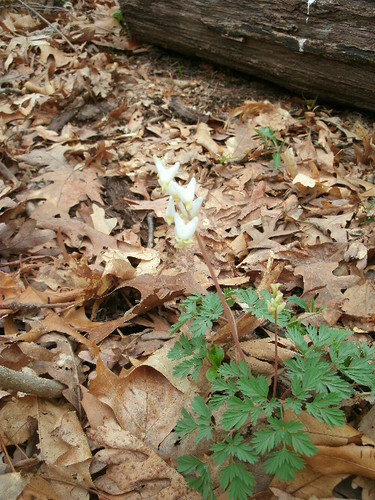 We also found some Dutchman’s Breeches which are also out about one month early. That was the theme of the day, cold but beautiful! The next class is Saturday, April 28th. Hopefully it will be a tad warmer. Thank you! Maybe in your area you can try it out? What a great high energy morning this was! 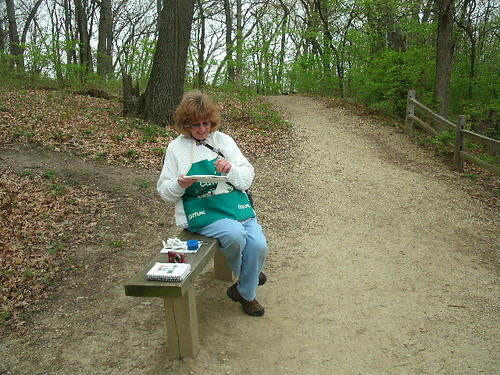 Thank you, Christine – and it did not matter to me that it was a bit cold – I felt like a kid again and all that was important was the fun we had painting and hiking! I liked the way you made your sketch “pop” with the micron pen! I’ve already made a few of these sketches (I added two geese to one) and I’m learning something everytime I try to do another. I am looking so forward to the next sketch class on April 28th. You are very welcome! WHen we are having sooooo much fun, I don’t even notice the cold. I had a ton of fun. That looks like fun, though a bit chilly! Enjoyed seeing everyone’s work. I know of no other blog where one can feel the mist on one’s face, and take a hike, and get to see great sketches– lovely post! It’s like you’re all appreciating creation both on paper and in person. That’s a combo that’s hard to top. Thanks!!! 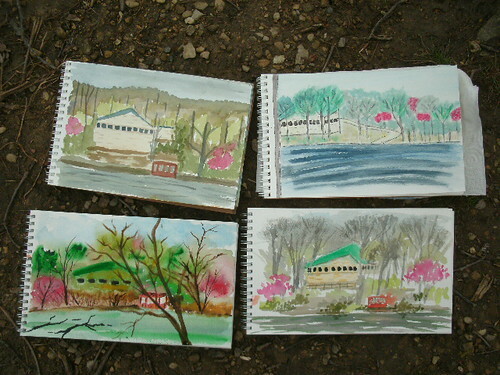 When I observe nature, I take alot in…but when I paint nature, I take in 40000X more. I’m sure you are the same, being such a great artist! Looks like another great field day. Wonderful sketches! Wish I were there. Nice sketches.